therapeutic stress buster activity which lets me express my creative side and bring more smiles in my life! Comments are more than welcome! Ok, Twi-fans do i have a treat for u. 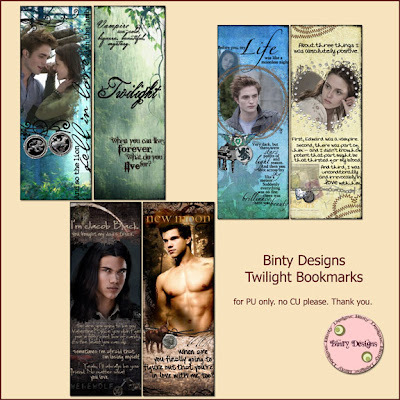 After collecting Twilight pictures, kits, WA and anything and everything with the words "Twi", I have now made bookmarks for my favourite books :). I read them over and over, as I am sure most of u do :). so obviously these Bookmarks will come in handy. Try them. I have put the instructions in the TOU included in the .zip file. All the to-print .jpg files are 5x7 size at 300 dpi - ideal for printing and each contain 2 sides of the bookmark. for Digital Scrapbookers only - Bookmarks Minikit : Click here to Download. for all Twi-fans and DigiScrapbookers - the 4x6 size version : Click here to Download. for all Twi-fans and DigiScrapbookers - for the 5x7 size version : Click here or on the Preview to Download. who wants a closer look ? - I do :). lol. ok here are the bookmarks in all their glory :). Numb BUMM - Sue, Honey Designs - Asal, ElegantWordart2 - Bethany. All three are huge Twi-fans just like me..lol ! And all Masks used in the bookmarks are made my "ME" :), which are also freebies which u can download from here. Remember : All bookmarks are only for "Personal Use". No "Commercial Use" whatsoever is allowed. These designers and I have created the graphics to be used only for PU, so please respect this. Thank-you for understanding :). Disclaimer : All pictures are copyright to their original owners. This is a non-profit site. No infringement or copyright is intended. by the Twi-fans, for the Twi-fans, of the Twi-fans. LOL!. Enjoy! Please do leave me comments, love to know what u feel about these bookmarks. - From a "crazy as hell" Twi-fan. ROFL. This is such a cool idea!!! I love them, Thanks for sharing it all with us, and for coming up with the idea and creating it! I'm gonna snag all of it. Thank you so much for this Freebie. I want to let you know that I posted a link to your blog in Creative Busy Hands Scrapbook Freebies Search List, under the Page 2 post on Aug. 28, 2009. Thanks again. Thank you! Your blog post will be advertised on the DigiFree Digital Scrapbooking Freebie search engine today (look for timestamp: 28 Aug [LA 07:00pm, NY 09:00pm] - 29 Aug [UK 02:00am, OZ 12:00pm] ). Love these. They are a great idea and I love that you are sharing them with the rest of the die hard Twilight fans. Thank you! Thank you! Love all your lay outs, and these ones are great as well! Thank-you for visiting and have a nice day ! She is a bringer of riches and wealth. She lives in clear-headed pine forests. She is only seen in the light of a shooting star. She wears purple juniper colours. She has gentle green wings like a butterfly.